Question (via email): Are there any trends in craft that you see that might have the popularity and durability of IPA? 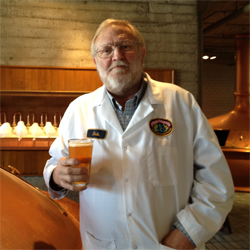 Bob: In my lengthy experience in the world of craft beer, I have seen many trends come, be the rage, and then fade. IPA, however, seems to be here for the foreseeable future. In the 1970’s there were Amber and Pale ales with a smattering less popular Stouts, Bitters, and a barley wine or two. By the end of the 1980’s we saw a big trend in wheat beers, especially Heffeweisen. IPA had just started to sneak into the mix along with just about every other style imaginable. There were some I couldn’t imagine like raspberry wheat, which I hated only slightly less than apricot and blueberry ales. Heffs ruled and seemed to be untouchable. Today we have many more beer style variations, with brewers coming up with something new every day it seems. What is noteworthy is that a large segment of craft beer consumers have discovered hops, and IPA is now the beer of the day. Heffs are on the decline, along with some other early favorites, and fruit beers seem to be fading in popularity as well – perhaps thankfully, depending on your point of view. There are some interesting trends here that bear watching. We are seeing an interest in sour beer that surprises me, but I don’t think that it will ever come anywhere close to the popularity of IPA. They will continue to be brewed until every brewer who wants to has done one, with a few classic examples from established breweries likely to have longevity. Likewise barrel-aged and other specialty beers. These are all interesting, sometimes very tasty, always difficult, time consuming, and expensive beers to get out of the brewery. They will always be with us but on a smaller scale. As IPA continues to grow in popularity with an increasingly larger percentage of the craft market, there are several styles to watch. Not everybody wants a hoppy IPA. Not everybody wants beer over 6% ABV. I see lighter, lower gravity, easier-drinking styles making inroads. Specifically, I see three styles in the craft area that I think will continue to grow and will have lasting popularity. Lager, as I have said before, is the most popular beer on the planet. As more and more people are gravitating to the craft beer experience, it is natural for the less challenging beers to grow. Lager is already a big number for many craft brewers, even if they mostly talk about their big, bad IPA. The big brewers have the craft market on their radar and are beginning to produce “crafty” lagers. Patterned after the Belgian original, “white” (or sometimes somewhat inaccurately called “wit”) beer has a surprisingly large following. Led by Blue Moon, a Coors Brewing product which is not technically “craft” by current definition, white is light and refreshing with a bit of spiciness. Blue Moon’s numbers alone exceed the total output of many craft breweries. Anheuser Busch has Shock Top, which is very similar to Blue Moon and has similar numbers. Craft brewers are very much aware of this and some see it as a profitable item that has a sales base already popularized by the big guys. This may turn out to be a situation where craft takes a cue from big brewing, rather than the other way around. In the American craft area, session – or “sessionable” – beers are the alternative to the high ABV IPA’s that have come to dominate the market. With health concerns and other problems attendant to the consumption of strong beers, I expect to see increase in popularity with many breweries offering a sessionable product.